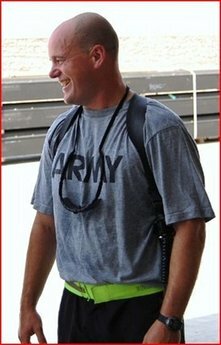 Chief Warrant Officer Michael Slebodnik, 39, of Gibsonia, Pennsylvania, died September 11, 2008, at Bagram Airfield, Afghanistan, of wounds suffered near Forward Operating Base Nagil, Afghanistan, when the aircraft he was piloting received enemy fire. He was assigned to the 2nd Battalion, 17th Cavalry Regiment, 101st Combat Aviation Brigade, 101st Airborne Division (Air Assault), Fort Campbell, Kentucky. For more information media may contact the Fort Campbell public affairs office at (270) 798-9966. Michael Slebodnik, son of William and Patricia Slebodnik died in Afghanistan on September 11.Growing up in Richland, Michael Slebodnik always wanted to play soldier, to the point where he'd even wear fatigues to school. Eventually, he spent more than two decades in the Army as a helicopter pilot. "I'm doing what I want to do," Mr. Slebodnik would tell his mother, Patricia. "And if I die, it's because this is what I wanted to do." Slebodnik, of Clarskville, Tennessee, was killed Wednesday in Afghanistan. He was shot while flying a mission and died while being transported for medical attention, according to his mother and his wife, Tanja. He was 39. 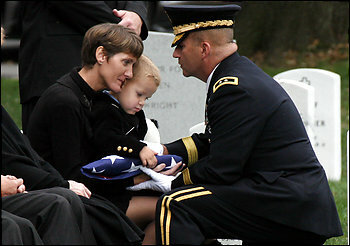 At the time of his death, Mr. Slebodnik was stationed in Jalalabad, Afghanistan, and had attained the rank of chief warrant officer, his family said. He was a loving father and a voracious eater, but first and foremost, Mr. Slebodnik was a soldier. "He's been in almost 22 years, and he could have easily gotten out," Tanja Slebodnik said yesterday. "He never chose that option. It's like a complete mission -- you don't leave until your mission is complete." As a child, Mr. Slebodnik -- who was called "Mickey" -- was a talented artist and a math whiz, but his primary interest was the military. He was fascinated by the Civil War and battle strategy and developed a strong bond with his grandfather, Wade Peters, who served in World War II. After graduating from the old Richland High School in 1987, he immediately joined the Army. Mr. Slebodnik was an aeroscout observer during Operation Desert Storm. He later served five tours in Iraq during the current war there and began his only tour in Afghanistan in January. He was fiercely committed to the military and frequently bemoaned the negative tone of news coverage and public opinion of Iraq when he came home. Mr. Slebodnik would tell family members that he saw progress there and conditions were better than they appeared on television. 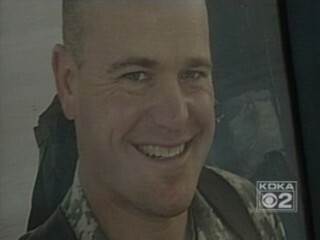 In Afghanistan, his mother said, Mr. Slebodnik helped train other pilots and flew numerous missions himself. But he regretted spending so much time away from home. Mr. Slebodnik had four children, ages 3 to 18, in addition to two stepsons. The family lives near Mr. Slebodnik's home base of Fort Campbell, Kentucky. Eager to watch his children grow up, Mr. Slebodnik talked of retiring from the Army, especially if he eventually was assigned to a desk rather than the air. He planned to move back to the Pittsburgh area and attend college, Patricia Slebodnik said, to become a teacher. 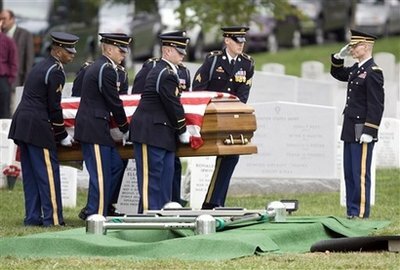 Instead, Mr. Slebodnik will rest in Arlington National Cemetery. For his family, it's a setting as poignant as the date of Mr. Slebodnik's death -- the anniversary of the September 11 attacks. "He died on 9/11 -- so appropriate," Patricia Slebodnik said. 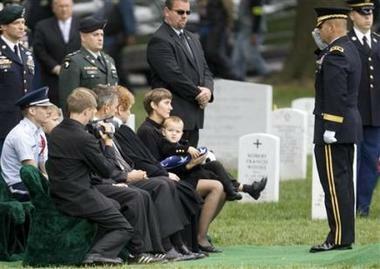 "My son was a soldier through and through." GIBSONIA, Pennsylvania — An Army helicopter pilot who grew up in western Pennsylvania was killed during a firefight in Afghanistan, his family said. Michael Slebodnik, 39, died Thursday after being shot near Jalalabad, according to his mother, Patricia Slebodnik, of Richland Township. She said the family was still waiting for more details on how he was killed. Slebodnik joined the Army after graduating from Richland High School in 1987, and had been a helicopter pilot almost the entire time since his enlistment, his mother said. 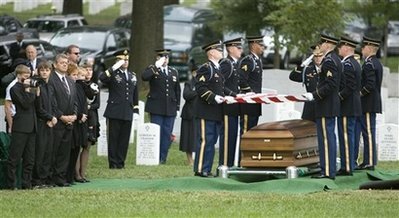 The married father of four children, ages 3 to 18, he was assigned to Fort Campbell, Kentucky, and lived in Clarksville, Tennessee. Slebodnik had been in Afghanistan since January and was scheduled to return to the U.S. next month. He had served five tours in Iraq since 2003 and was a veteran of Operation Desert Storm, according to his family. “He loved the military. He wanted to fly. 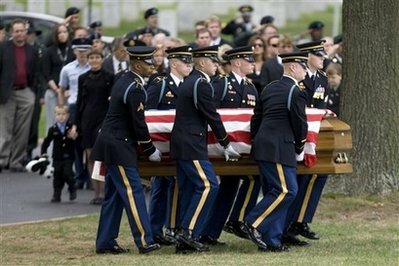 He loved being a soldier,” Patricia Slebodnik said. Dan Slebodnik, of Richland, said his brother had been fascinated by the military since childhood. “He knew everything about every battle that was ever fought — World War II, the Civil War, even the ancient battles,” Dan Slebodnik said. Michael Slebodnik was planing to retire from the military and wanted to return to western Pennsylvania, get his college degree and become a math teacher. GIBSONIA, Pensylvania - A final goodbye was held today in Gibsonia for a soldier killed by enemy gunfire last week in Afghanistan. On September 11, Chief Warrant Officer Michael Slebodnik, 39, a native of Gibsonia, died at Bagram Airfield. He died fighting the very forces that attacked his country seven years to the day. The Department of Defense says he suffered wounds after his aircraft was hit by enemy fire near the Forward Operating Base in Nagil, Afghanistan. Today, Jody Deems sang and talked of her beloved brother during a memorial service at St. Richard's Catholic Church. "Mickey loved his country," she said. "He loved being a soldier, it's all he ever wanted to be." Slebodnik, of the 101st Airborne Division, also fought in Desert Storm and did four combat tours in Iraq. He was nine months in to his Afghanistan deployment when he was lost. "When the two military officers showed up it was like out of a movie, but reality is starting to set in, Mickey is gone and we cry for ourselves because we're going to miss him," said Deems. "The task, the mission God gave Mickey has been accomplished. Every time he got in that helicopter he knew he was in God's hands," said Rev. Fred Byrne, of St. Richard's Catholic Church. Deems said when her brother was in the cockpit, he was a consummate professional. "He said, when you get in a fire fight, you become so busy focusing on your job you have no time to be scared," said Deems. Yet despite what he witnessed in war, she says in life, Slebodnik had compassion, character and was faith epitomized. "Mickey believed in God and believed in prayer," she said. "He looked for the goodness in everyone. He also told my mom he loved what he doing, and if he died, he did it doing what he loved and not to be sad." Slebodnik is survived by his wife, four children, two stepchildren, his parents, a brother and a sister and a grateful nation. He graduated from Richland High School in 1987. 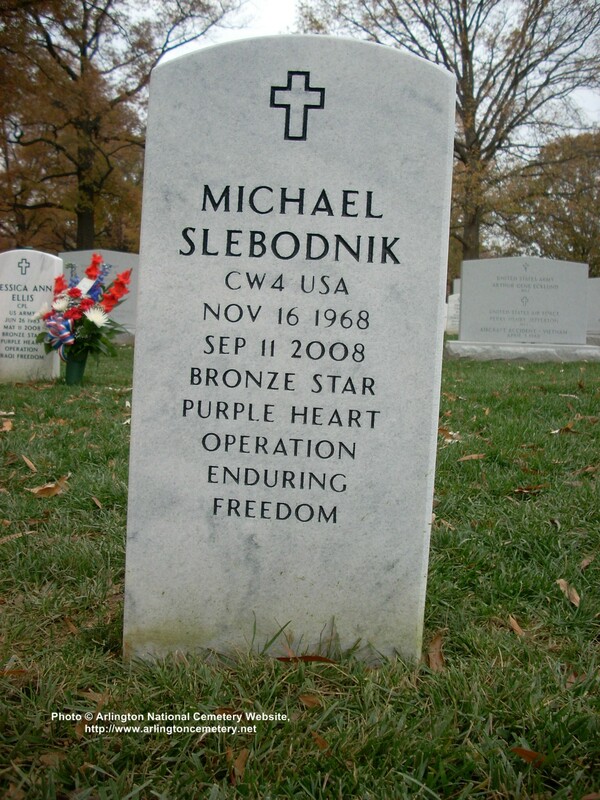 Slebodnik will be buried amongst other heroes at Arlington National Cemetery. In his final letter home from Afghanistan, Michael Slebodnik reminded his sister Jody Deans of the times he would dance around the house, singing falsetto like Frankie Valli. With his return from duty less than two months away, Slebodnik recalled disco dancing with his sister while listening to ABBA songs. Deans read portions of that final letter during a memorial service for her brother Saturday, as several hundred friends and family members gathered to remember the fallen soldier with laughter and tears. Slebodnik, 39, a Richland native, was fatally shot during a firefight near Jalalabad on September 11, 2008. A 1987 graduate of the former Richland High School, he joined the Army after graduation and resided in Clarksville, Tennessee, with his wife, Tanja, four children and two stepchildren. 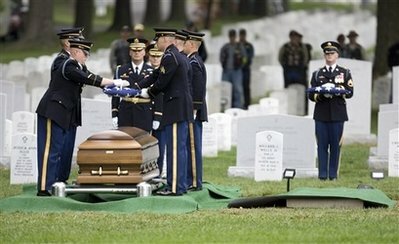 He will be buried in Arlington National Cemetery in Arlington, Virginia. Michael Slebodnik's interest in the military was apparent from an early age. As a child, "Mickey," as his family called him, wore camouflage, played with army men, painted models and staged battles. He was so eager to join the Army that he went through a delayed entry program and enlisted at 17. "I think he came out of the womb that way," said his mother, Patricia Slebodnik. "He just loved anything like that." Said his father, Willie Slebodnik: "He always had the military in his mind." From a decision made when he was young came an Army career that spanned more than two decades, service in three wars and dozens of medals, badges and other accolades. And it came to an untimely end when he died last month in Afghanistan. 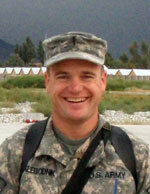 Chief Warrant Officer 4 Michael Slebodnik, 39, died September 11, 2008, at Bagram Airfield. He was conducting a reconnaissance and surveillance mission that day when the OH-58 Kiowa Warrior helicopter he was piloting came under small-arms fire near Forward Operating Base Nagil, according to the Department of Defense. His mother said she believes he was shot in the leg and bled to death before he could receive medical attention. 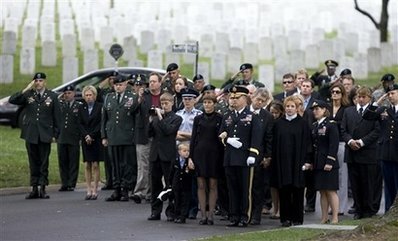 More than 100 friends and family gathered yesterday to see Slebodnik buried at Arlington National Cemetery. 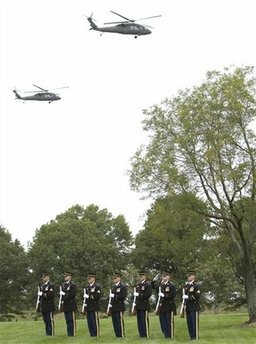 A quartet of Black Hawk helicopters flew overhead at the start of the service, honoring the man who had been a helicopter pilot for his entire military career. Slebodnik was born in Gibsonia, Pennsylvania, and lived in Tennessee with his wife, Tanja. He would have turned 40 next month. He was assigned to the 2nd Battalion, 17th Cavalry Regiment, 101st Combat Aviation Brigade, 101st Airborne Division (Air Assault), based at Fort Campbell, Kentucky. He loved flying and loved serving, his mother said. He became a warrant officer after Operation Desert Storm and then became an instructor pilot. He had been to Iraq four times since 2003, and had been in Afghanistan since January. "I'm sad for us, but Mike basically died doing what he loved doing," Patricia Slebodnik said. She said Slebodnik had a big smile and cobalt eyes so blue they were almost electric. He was very religious and very positive. His faith and upbeat attitude helped him fly, she said. "He was never afraid," she said. "I asked him. He said, 'No, Mom. For one thing, it's really noisy in the helicopter. Sometimes when you're being shot at, you don't hear it because it's so noisy. And you don't have time to be afraid.' "
He was into military strategy and enjoyed reading about the strategies and battles of the Civil War and both world wars. Slebodnik came from a family with military ties. His father served in Vietnam. His grandfather, Wade Peters, was a bomber pilot in World War II and retired as a Colonel. When Mickey Slebodnik got his wings, his grandfather pinned them on. He loved playing chess, which his mother attributes to the game's strategic aspect, and loved kids. He had six children, ranging in age from 3 to 18. His mother said she has received mail from numerous strangers, such as the letter she got from a woman thanking her because Mickey had saved her son's life. "He was a good person and he made a difference in a lot of people's lives," Patricia Slebodnik said.